For the intelligence and security officials charged with the formidable task of keeping Britain safe from terror attacks, it was simply a question of time before a lone fanatic brought carnage to the streets. Politicians, the police and intelligence chiefs have been warning for months that Britain faced the imminent threat of attack following the recent wave of atrocities committed in European capitals such as Paris, Brussels, Berlin and Istanbul. And, with Islamist terror groups like al-Qa'ida and Isil showing no signs of abandoning their commitment to attacking the West, Britain's security forces have been in a state of high readiness in anticipation of such an attack. Compared with other European cities, London has, until yesterday, escaped relatively unscathed from the growing menace posed by Islamist fanatics. Indeed, it is down to the constant vigilance of its security services that Britain has not suffered another attack on the scale of the July 7 bombings in London in 2005, in which 52 people died and more than 700 were hurt. At the time, British security officials admitted they were struggling to get on top of the growing threat posed by Islamist militants. But lessons were learned as a result of the attacks, so that in recent years a number of high profile terror plots have been foiled and the perpetrators brought to justice. One of the more audacious attempts concerned blowing up a number of aircraft flying from Heathrow in 2006. Consequently, UK-based Islamist fanatics have been forced to resort to carrying out lone wolf attacks, such as the murder of Fusilier Lee Rigby, who was hacked to death by machete-wielding Islamist terrorists in Woolwich in 2013. 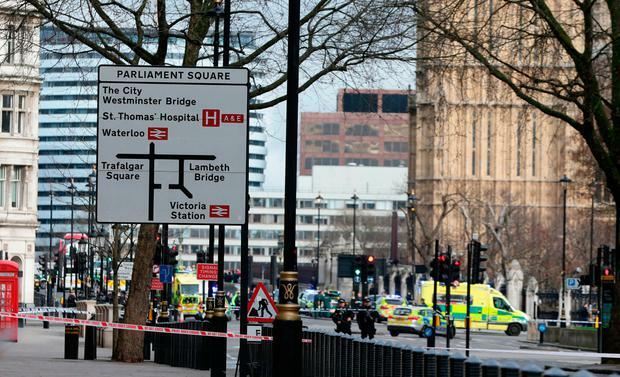 Latest intelligence assessments suggested this was the most likely form of attack that Britain would suffer, and it was because the security forces were able to respond so quickly to yesterday's attack in Westminster, that casualties were kept to a minimum. Of course, there will be the inevitable inquiries into how the attack was allowed to happen, with the police and security services examining whether those responsible for this attack could have been apprehended in advance. They will also be looking at the timing of this attack, and whether it was in any way related to the government's decision to ban electronic equipment from aircraft. That measure has been imposed in response to new intelligence acquired by security officials in both Britain and the US that Islamist terror groups have developed the technology to conceal explosives in everyday electronic devices that are not picked up by airport scanners. The intelligence shows that Islamist terrorists are still intent on carrying out bomb attacks on civilian airliners because, if successful, they incur mass casualties. But, as yesterday's attack demonstrates, perpetrating acts of terror does not rely on much sophistication. All it requires is a lone fanatic determined to pursue their vile creed for innocent civilians to lose their lives.